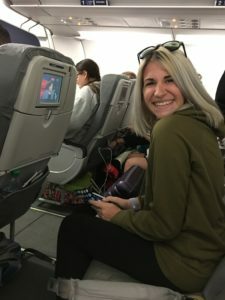 I was so nervous about the red-eye flight. If we didn’t sleep, I knew that next day was going to be miserable. Did we sleep through the whole flight? No, but we did mange to get some shut eye. What was our strategy? 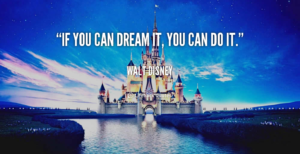 We both would be dreaming of Disney World all night long! We both worked all day, came home, had dinner, packed up our stuff, and then left for LAX about 7:30pm. Our flight departs at 11pm. We live about an hour from the airport, but it was a Friday night so we wanted to give ourselves a little wiggle room, just in case. The 405 parking lot might cause us a delay or two or three.. In our carry-on we had everything we needed for travel. We had eye masks, pillows, blankets, ear phones, music devices – ipads/ipods and phones. We had some snacks, and all our medicines, too. We both took dramamine and we wore sea bands. Neither of us has ever been airsick, but we both tend to get a little queasy on bumpy car rides, so what the heck? And dramamine makes you drowsy, so that’s a bonus! I also brought some Advil PM, just to push me a little more in the drowsy direction. The Snooze Kit – eye mask and ear plugs! We got to the airport early. Lined up to check in and drop off luggage and then got the gate. We didnt want to do anything too stimulating, we wanted to be tired. So we sat and watched some stuff on our ipads. Took our dramamine, and Advil PM about 45 minutes before the flight. We upgraded to the Extra Space seats on our Jet Blue fight. I felt this was a good upgrade because it gave us just a little more room to spread out and get comfy. It also allowed us to get on the plane early, and get situated before we took off. 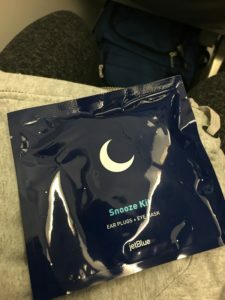 Jet Blue gives each traveler a little package with an eye mask and ear plugs. Very nice touch! We kicked off our shoes, got our blankies out, and our travel pillows (ended up being very uncomfortable – the neck ones would have probably been better. Know for next time! Anyway. we had both gone potty before we got on the plane, so we should be able to sleep through the whole flight. Its about 5 hours long. They did their short little flight instructions and then we were off. I felt pretty comfy, and my body was definitely ready to sleep. I found an XM channel to listen to and closed my eyes. I went into the bathroom and washed my face, brushed my teeth, tried to fix my crazy hair and went potty. Got back to my seat and they started announcing that we would be landing soon. they brought around some warm cloths, which felt great because I just washed my face with COLD water. Wow, great timing! I didn’t feel exhausted. I didn’t feel groggy. 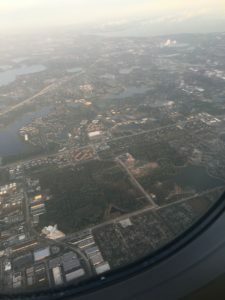 I could have definitely slept more, but I was so excited to be in Florida, and so excited to start our vacation, that the adrenaline must have kicked in. We seemed to have plenty of energy, we were not acting tired, nor feeling like we needed caffeine or anything! We wanted to something small to eat, but we really both felt pretty great! We both felt like even though we only slept a little bit, it would be enough to get us through the day. We didnt even seem to notice the 3 hour time change, which was interesting. When it was lunchtime, it felt like lunchtime. When it was time for dinner, it felt like dinner time. So that worked out really well. 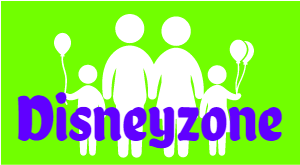 We stayed up the entire next day – in fact we went to all 4 parks in one day! We collapsed as soon as we laid down that night, but all in all – the red-eye was a success! What would I do differently next time? Bring a more comfy pillow, people seem to like the horseshoe neck pillows. I think the most important part for me will be to practice sleeping in a sitting position. And that’s really about it. I felt like we were pretty prepared, we had everything we needed, we both were plenty sleepy.. Getting up with the sun, and acting like it was our normal timezone worked – we adjusted to the time change pretty easily. 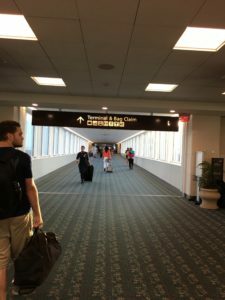 Going back home was harder – not because of the time change, just because we were so exhausted from running non-stop for 5 days!! !